We hear every day from prospective residents that seeing a Dwelo-enabled apartment shoots it right to the top of their lists. We put together this toolkit of Dwelo assets so communities can promote this incredible amenity as they advertise their vacancies to the public via Craigslist, Postlets, Zillow, in-person, and in other media. Includes gallery images to add to your listings so you can capture the demand for smart apartments with every post. Together with the kit above, copy and paste (Cmd/Ctrl + V) this copy into your listings to promote Dwelo as an amenity. This is a Dwelo smart apartment. It's like having your apartment in your phone. You can let a friend in when you’re on vacation with digital locks. Or turn off all your lights from bed. Or save money by automating your climate. Those superpowers and more just come with the apartment—Dwelo is free and included with your rent. Learn more at getdwelo.com. To promote Dwelo as an amenity on your website, copy this badge and link the image to http://getdwelo.com on your site. Includes leave-behinds, labels and printable promotional flyers for units that are being shown to prospective residents. Designed to spark interest and provide selling opportunities for property managers / agents. Current printed materials also available upon request at support@dwelo.com. 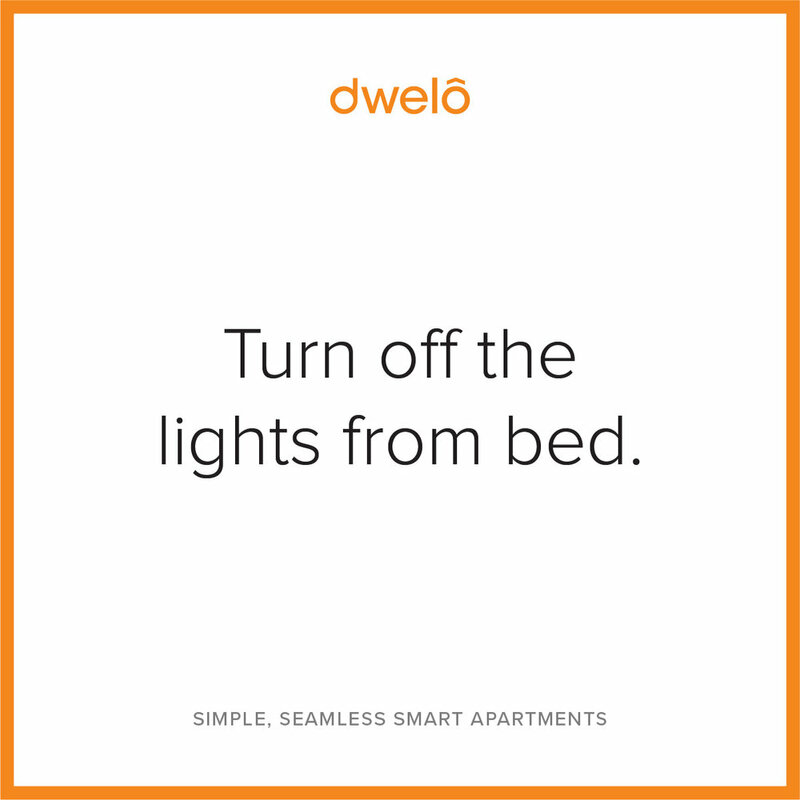 Upgrade your community by advertising your new Smart Apartments powered by Dwelo. These banners come in three sizes, allowing to fit any need or space you might have. 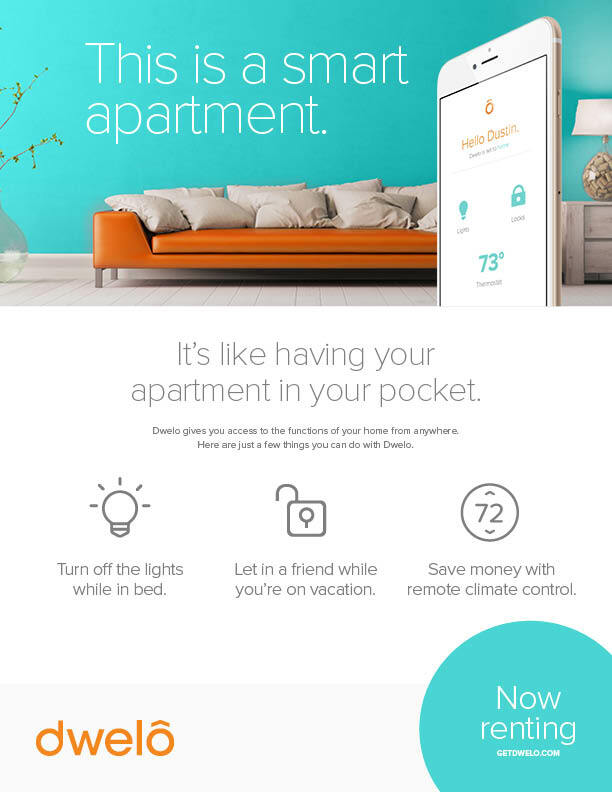 Promote your new Smart Apartments with these simple social media posts highlighting the benefits of a Dwelo Smart Apartment. The Dwelo logo appears in full wordmark form, and as the standalone 'o' icon. Get the approved source files here, for use in digital or printed materials. A comprehensive outline of the Dwelo brand, purpose, mission, assets, and instructions for how to implement them.